The Daily Digress: Games for kids are lame. Games for kids are lame. I don't like playing with children. I don't get grownups who think children's games are fun and go on and on about the importance of "being playful" (make sure you say that in a lame, fake child-like voice to get the full effect). The only time I've had an inner child is when I've been pregnant. I like being a grownup. I don't miss being a kid at all, although it's a perfectly nice thing to be, when it's your time. I like grown up stuff, like staying up late, drinking, not going to school and doing whatever I want (in your face, Mom!). Scrabble Junior - really, they can play the real one. Scrabble Jr. is nothing but fill in the (predetermined) blank. Boring! Apples to Apples Jr. - I got this because the adult version sounded fun. The kid version is not fun. It's painful. My mistake. Monopoly - with people who can't count. It's not so bad with older kids, but it takes too long. And they get so mad when they don't have any money left. I think this is a good life lesson. Get used to it, it happens to me all the time. O and the X-Man know if they want me to play, it'll have to be Yahtzee!, Blokus, Uno, Sorry! or the recently-added-to-mommy's-short-list Clue. We played Clue at the beach, during a visit with my Mother in Law. I'm pretty sure I pulled it out and made the boys play with me in an attempt to escape her political discussion monologue, which is even more excruciating than a game of Candy Land with a two year old who thinks you're cheating. I'm pretty darn Liberal, but listening to my Mother in Law talk politics is enough to make me want to vote Republican out of spite. Clue was the only game at her house with most of the pieces, so I picked that one. I got to be Miss Scarlett, just like I always was when I played with my sisters, because I was the oldest and bossiestmost assertive. Yes! We had to make more of the tally sheets, which took up a good chunk of time and was quite satisfying to this mother of a one year old who never accomplishes anything. I had to use a ruler to draw the lines and I felt pretty important. I need to buy Clue for our house, because it's definitely on the list now. Bonus: My Mother in Law told me how wonderful I was for doing such a thing with the children. She said she admired me. She's French, so I'm never sure if she's being nice or totally sarcastic. Like when she tells me my shorts and tank top are "elegant." I've decided it's not my job to read tone, so I just listen to the words and say thank you. Which probably irritates the heck out of her. Muwahaha! I'll also play Pool, but I will not let those little rats win or even cheat. I don't care what Daddy does! They're not good enough for a decent game of Ping Pong yet, but that'll happen soon. We don't have a spot for either of those at our house anyway. We do, however, have a lovely and previously unused side porch that now houses a...drum roll...building more drama...wait for it...FOOSBALL MACHINE!!! Yes, you read it right. I know you're slamming your fists and tearing your hair with jealousy. Too bad! It's ours! The machine used to live at my parents', but has been locked away in a dark and dusty basement for far too long. One of the players wears a jersey with my brother's name written on the back - what a coincidence. My husband and I set it up the other day and, while the children pressed their little noses against the door and begged to be let onto the porch, we played a couple rounds. My husband thinks he's so great, but (honey, hope you're reading!) those games were just practice! And he should also know that it wasn't nice to make fun of me for calling my guys "dudes," as in "Hold on! I didn't line up my dudes yet!" Because he was kind of cheating and dropping the ball before I was ready. Anyhow, like I said, those were practice and it should be noted that I was rocking serious Foosball skills later. I beat my son O, two out of two, and he was trying. It's good for kids to lose; it helps them understand how the real world works. 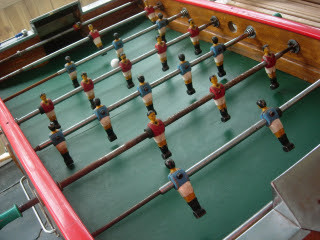 We may need to reserve adult Foosball for times when our neighbor isn't home, because we get a little loud. My two favorite things to yell are "Sonofabitch!" and "In your FACE!" I'm not above whooping and hollering either. Are you surprised? I think I'm doing my kids a favor by not pretending to be interested in their games. The whole false praise as a self esteem booster that adults used on my generation turned a lot of us into apathetic slackers (yup, I'm talking about myself here*). One of the reasons we had more kids is so they could entertain each other. And I don't want them to become the kind of adults who bore other people with, for example, long speeches about politics. I'm trying to teach them to find common ground with their friends. I'm also trying to teach them not to swear. But I refuse to get rid of the Foosball machine, so I may have to live with the swearing. Oh well, I'm doing my best. * There's a great book by Alfie Kohn called Punished by Rewards: The Trouble with Gold Stars, Incentive Plans, A's, Praise, and Other Bribes that covers this. Well, I say the book is great, but I haven't actually read it. Slacker that I am, I just skimmed it, so I would have more time for reading websites about celebrities. But I think I got the major points. Maybe you can read the whole thing and tell me about it, you go-getter! OK, so, I am leaving a comment here. Yup! Agree ya all the way! While we have some of those kiddie games, they for them to play with each other. Or, they were. Kids all being literate now, we got rid of them: donated to his house or thrift of choice. What about Stratego? Or, checkers? O, and when do I get play you some fusball?? Well said! And why do my kids always want to play the games that I hate? They want to play Monopoly or (shudder) Life. I'll play mindless games like Sorry, especially when I can actually close my eyes between turns. Preferably when I can occasionally say, "Take my turn for me." And the junior games are even worse, you're right. Regular Apples to Apples is fun, and so is Scrabble.